Even for people with the greenest thumb, it can be challenging to have a well-maintained lawn. With the presence of pesky pests and unpredictable weather conditions, among other things, the health of your yard can suffer. Enter the world of organic lawn fertilizers! With the latter, you can be confident that the soil will have balanced nutrients that will allow plants to grow. They are free of toxic chemicals! With the plethora of options available, which one should you pick? If you need a helping hand, read on and learn from some of our recommendations. You do not have to spend hours to research online and be bombarded with confusing claims. Instead, this section details some of the best products that should be on your radar. One of the best things about this fertilizer is the fact that it uses plant-based nutrients. It does not contain bio-solids, manures, and poultry litter. It is also a good thing that it does not come with a foul odor. If you are looking for value for money, this lawn fertilizer got you! One pack already has a maximum coverage of 5,000 square feet. With the use of this fertilizer, you will be able to repair thin lawns, alleviate soil stress, and encourage a robust root system, among other benefits. This product is formulated with All-in-One Particles, an innovation that has been exclusively developed by Scotts. Basically, this is the one that is responsible for the infinite greening and feeding benefits to the lawn. With the use of this lawn fertilizer, the grass can grow thicker. In return, this will be effective in warding off the growth of weed. It also strengthens the roots of the plants to make them less susceptible to damage. As it has been recommended by the manufacturer, for the best results, you should apply this product once every six to eight weeks. 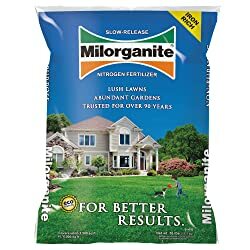 With the organic formula of this lawn fertilizer, which is made of heat-dried microbes, this is an excellent choice when you have pets and kids at home. This product has an NPK ratio of 5-2-0. This is sufficient to give life to unhealthy grass and provide the nutrients that the soil needs for plants to grow. To add, the effectiveness can also be attributed to the presence of sulfur, manganese, copper, and zinc. This fertilizer has a homogenous blend of natural ingredients that can effectively promote a healthy lawn, including seaweed extract, soil microbes, alfalfa meal, potassium sulfate, feather meal, and fishbone meal, among others. Once applied, the effects of this fertilizer can last for up to three months. While it is working in the soil, it will control the build-up of thatch, promote the growth of hardy root system, and enhance the overall quality of the soil. Some of the main ingredients that are attributed to the effectiveness of this product include feather meal, iron oxide, poultry manure, elemental sulfur, non-staining iron, and bio-tone microbes. 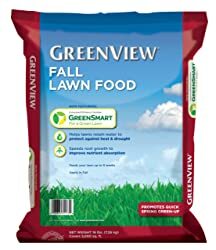 With the 30-pound pack of this lawn fertilizer, it will be more than enough for the treatment of an area that is up to 5,000 square feet. 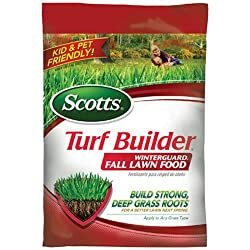 If you are looking for a quick way to have a thicker and greener lawn, this is one of the best fertilizers that should be on your list. Regardless of the type of grass that you have, you can be confident that it will deliver unmatched effectiveness. One standard box of this fertilizer contains five pounds, which is enough for treating an area with a maximum size of 4,000 square feet. Using this fertilizer will give you soft green grass like a carpet, which is sure to make you at the envy of your neighbors. One of the best things about this fertilizer is the fact that 30% of its ingredients are derived from food waste. It has no miracle or toxic chemicals, yet you can have the assurance of its ability to enrich the soil without burning. To add, this is a 4-4-4 natural fertilizer. It has a balanced formula that contains nitrogen, phosphorus, and potassium, all of which are vital in stimulating healthy growth of plants. For the maximum effectiveness of the fertilizer, the manufacturer recommends the use of one cup for every five square feet. If winter is about to come and you would like to prepare your lawn, this is one of the products that you might want to consider. It has a special formula that promotes the growth of roots and fall seeding. This will also help in the prevention of winter stress. It is formulated with iron, sulfur, and nitrogen, which will work together to make sure that the lawn will have a deep green color, which will be indicative of the health of the grass. 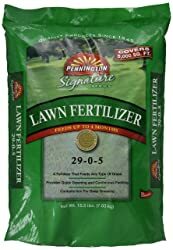 With a 45-pound pack of this fertilizer, it is enough to cover a lawn that is up to 15,000 square feet. The best thing about this product is that it is hand-crafted in a small facility, making sure that there is attention to every detail. This provides an assurance that the quality is unmatched as against those that are mass-produced. It provides 100% nutrition, including the macros and micros that will be needed for healthy root development. The latter can also be attributed to the balanced content of N-P-K.
One gallon of this fertilizer will be enough to treat a 5,000 square-foot lawn. This lawn fertilizer comes with a 15-0-15 concentration of nitrogen, phosphorus, and potassium. If your lawn needs phosphorus, you should consider choosing another product. With a combination of humic and fulvic acid, using this fertilizer will be effective in intensifying the color of the grass in the lawn while also maximizing the growth of the roots. Plus, it aids in the transfer of the nutrients throughout the plant cells. Lastly, it is made for all types of grass commonly grown in the lawn, such as Bermuda, Centipede, Palmetto, and St. Augustine, among others. This is an all-purpose lawn fertilizer that is capable of feeding all types of grass. Best of all, it feeds for up to four months, so there is no need for frequent application. From the label of this product, it says that it has 29-0-5 concentration of nitrogen, phosphorus, and potassium. It is also worth noting that it contains iron, which is the one that is responsible for the deep greening of grass in your lawn. If you want your lawn to be green and healthy, it is recommended that you choose a fertilizer that does not contain phosphorus. This is exactly the reason why this product should make it on your list. One of the main benefits of using this fertilizer is its ability to speed up the growth of the root. In turn, this will effectively improve nutrient absorption. It also delivers the benefit of water retention. Plus, it increases the ability to fight heat and drought. The manufacturer recommends the application of a 16-pound bag for every 5,000 square feet of lawn. To maximize the effectiveness, the application is best to be done before fall. This fertilizer went through a process called cold process hydrolysis, which the manufacturer claims to be far superior compared to emulsion. It has complex nutrients that will promote greener grass and bigger blooms. Ease of use is also one of the best things about this lawn fertilizer as there is no need for complicated mixes. It also comes with a special formula that won’t cause clogging to your gardening equipment. Hate waiting for a long time before grass in the lawn grows? This organic fertilizer can offer the perfect solution. It has a very low content of salt and there is also a minimal chance of burn. Plus, it has the trace elements that will be needed to establish healthy soil. Since it exists in liquid form, it is also beneficial in terms of quick absorption, especially through the leaves. Keeping the grass healthy can be a lot easier if you have a fertilizer like this. It contains iron, manganese, sulfur, boron, amino acids, and alpha kelp, among others. Aside from perking up your lawn, it is also effective for growing common household crops, such as tomatoes, eggplants, and even roses. It is also helpful in improving the immune system of the plant, providing it with better defense against diseases that could damage its health. With organic fertilizers, you can keep the lawn free of pests and diseases that can harbor and destroy the yard. The products mentioned above are free of toxic chemicals that can do more harm than good!